Ensuring the driving public is aware of your work zone is an integral step to stop accidents within your work zone. 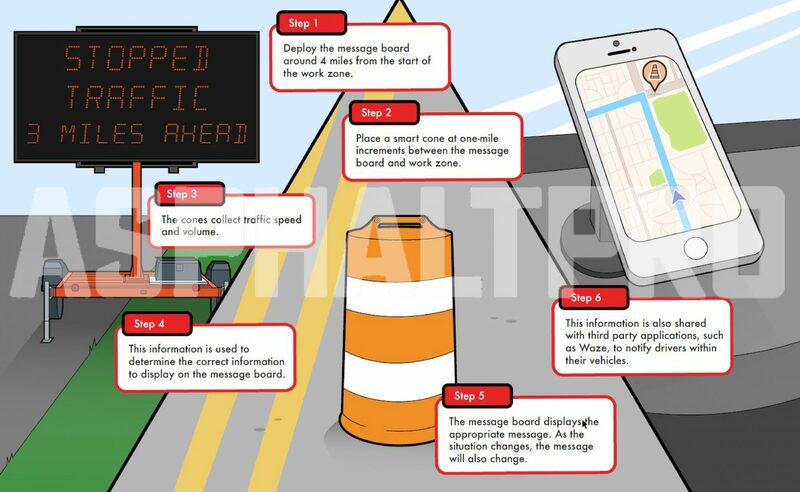 That’s why the team at iCone Products LLC, Cato, New York, developed its iCone real-time traffic message board system. Here’s how it works. First, one of iCone’s traffic control contractors will set up the system on your work zone, which takes about 30 minutes. The typical system includes a handful of traffic cones and one or two message boards. A message board will be placed around 4 miles upstream of the work zone. A smart cone will be placed at every mile from the start of the work zone to the message board. If traffic is expected to extend beyond 4 miles, a second message board will be placed typically 8 miles upstream of the work zone, with additional cones at every mile in between. Once deployed, the sensors within each smart cone will begin to measure traffic speed and volume. This information is then transmitted to iCone’s servers in New York, where the data is run through a number of algorithms to determine what information should be displayed on the message board. For example, if traffic has slowed to 10 miles per hour at the cone 1 mile from the start of the job, the message board at 4 miles would display, “Stopped traffic 3 miles ahead.” If the cone 2 miles out sees a slow down, the message will change. As the situation changes, certain individuals on the crew or at the agency can be notified in real-time by text or email. The information is also shared with GPS navigation app Waze every two minutes from the time the message board is turned on to the time it is turned off. By the end of the year, iCone data will also go to Google, and eventually, directly to connected cars with integrated communications systems, like those Toyota and GM plan to roll out in 2021. For more information, contact Ross Sheckler at (315) 626-6800.